Capital One Arena is in the Chinatown/Penn Quarter neighborhood, home to many great restaurants. But not all are suited for the lively Wizards, Caps, and concert crowds. These are a few of our favorite pre- and post-game options both in and around the Capital One Arena (formerly known as the Verizon Center). Ramen at Bantam King. Photograph courtesy of Bantam King Facebook. 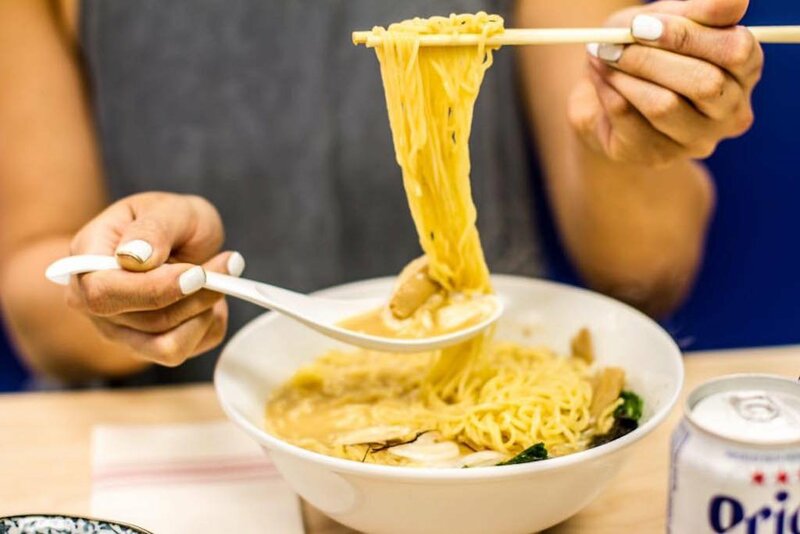 These sister ramen shops can get packed, but it’s worth angling for a stool at either to slurp delicious noodle soups. Daikaya offers a small menu with Sapporo-style ramen, while upstairs, a dimly-lit izakaya is the place for cocktails and small plates. Bantam specializes in chicken two ways: fried and in rich soups. Momofuku creator David Chang brought the concession version of his fast food concept to the arena last year. Want to sample the spicy fried-chicken sandwiches and jalapeño fries? Get in line. Barbecue, brews, and margaritas are the order at this Texas-themed ‘cue spot, which boasts a large bar area and space for live music. Look for daily specials like pitchers of Shiner draft beer. José Andrés’s Spanish restaurant is still going strong after 25 years. The menu continues to evolve, but the classics are still delicious–don’t miss the creamy chicken croquetas served in a resin shoe. The original Adams Morgan burger joint slings some of the city’s best patties and fried-chicken sandwiches. At their arena stall, find its Bogan Bun, a burger with bacon-XO jam, pickled red onions, special sauce, and gouda; the classic Lucky Bun cheeseburger; the Hot Tiger Bun, a spicy fried-chicken sandwich with pickles and Chinese mustard; and chips with curry sauce. Tavern standbys get an upscale gloss at this three-level restaurant. The cocktails are easy-drinking, the tasty bistro burger is gilded with creamy comeback sauce, and the pizzas emerge from a brick oven. Big booths (and ample crayons) make it a favorite for families with kids. The St. Louis-based Pi chain specializes in deep-dish, a woefully underrepresented style in these parts. The crust is more crunchy than bready, thanks to a cornmeal-dusted base, and the whole thing is saved from being just another cheesy carb bomb by a thick layer of extra-tangy, extra-chunky tomato sauce. This penny-tiled dining room, a New York export, has a something-for-everyone menu that’s especially strong with bar snacks. A mess of freshly fried potato chips are doused in warm blue cheese, while butternut squash rings and calamari are expertly fried. Victor Albisu has turned part of his former steakhouse Del Campo into a branch of his popular taqueria chainlet. Go for crispy sopes topped with al pastor pork, or the arabe taco holding grilled chicken, mint, and spicy yogurt. Miss NYC pizza? This slice shop is about as close as you’ll get in these parts. There are plenty of clever riffs—a chicken tikka masala pizza, a penne a la vodka pizza—but we’re partial to the simple grandma pie, a thick, puffy square arrayed with mozzarella and fresh basil. A beer flight at City Tap House. Photograph courtesy of City Tap House. 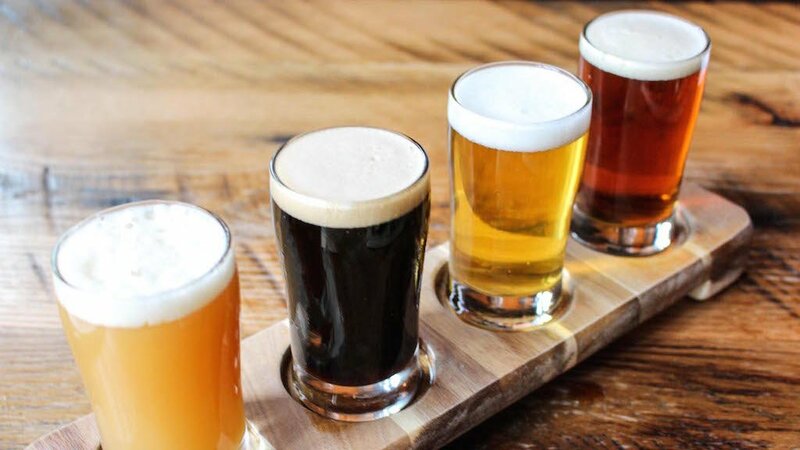 Beer fans can get their fill at this craft brewhouse, which also serves a late-night menu until 1 on Fridays and Saturdays with stomach-padding options like pizzas and wings. The happy hour deals at Clyde’s are some of the best around–and include evening and late-night discounts, including half-off raw bar items like oysters, mixed drinks, wine, and whiskey. If you want to escape the rowdy Verizon Center scene for a date-night drink, this cozy subterranean bar does the trick. The theme nods to the 1920s with Art Deco decor and classic cocktails such as Sazeracs, Aviations, and Hemingway daiquiris. There’s also a small, eclectic menu of snacks. This 60-seat wine bar features tons of themed flights and by-the-glass selections, along with a shortlist of snacks, like burrata with brown-butter vinaigrette or tuna crudo with coconut. This mid-Atlantic-themed bar sits just under Bantam King. Pre-game the Delaware beach way, with orange crushes and Fisher’s popcorn. Head to Iron Horse for fun and games (shuffle board, Skee-ball). A no-frills happy hour runs daily until 8 PM, and includes $5 wines, mixed drinks, and $2 off draft beers. Hungry after the big event? Hit this Passion Food Hospitality spot for its 9 PM happy hour. Five bucks gets you plates like barbecue-chicken spring rolls, gingery potstickers, and Baja-style fish tacos. If watching a game makes you want to play games, this subterranean watering hole is a good spot. Players can pick between pool, shuffleboard, darts, and more.